Hi, as I said in my last post I would be back soon.... well, here I am and again, so excited to be back in the craft room and having a blast!! This Challenge is with Through the Purple Haze. You're in for a treat as we have some awesome cards posted by the DT Team and we have some new girls that just joined us that are quite talented. 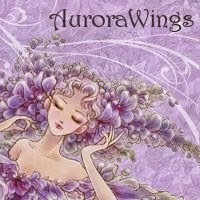 The is Daffodil and she is from Aurora Wings.... a real cutie!! 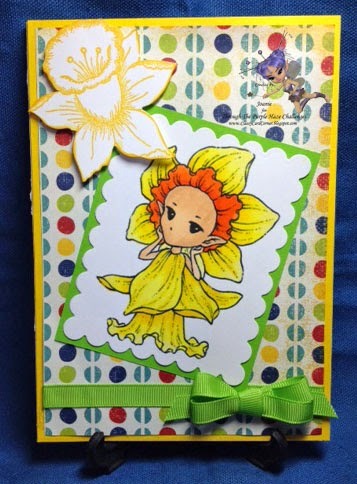 The Daffodil flower was made using a Heartfelt stamp and die from the set Daffy Daffodils. The paper, solid, is Recollections and the patterned paper is by 7 Gypsies, Naxos. Spellbinders scalloped die was used for stamped image. Tied a green bow from my Ribbon Stash and there we have it. I hope you enjoy my cards as much as I enjoy making them. A really great hobby!!!! Okay, our challenge is "Anything Goes", so get your scrapping stash out and join in the fun and you could be our next winner!! Well, that's all I have for today. So glad you came to visit and I'll be looking forward to your next one. If you're new to my blog, feel free to poke around and see what has been done in the past posts. Love your card, and your coloring. Welcome back to a new challenge!!!! !